Craft Editions visited the West of Ireland in June 2016. 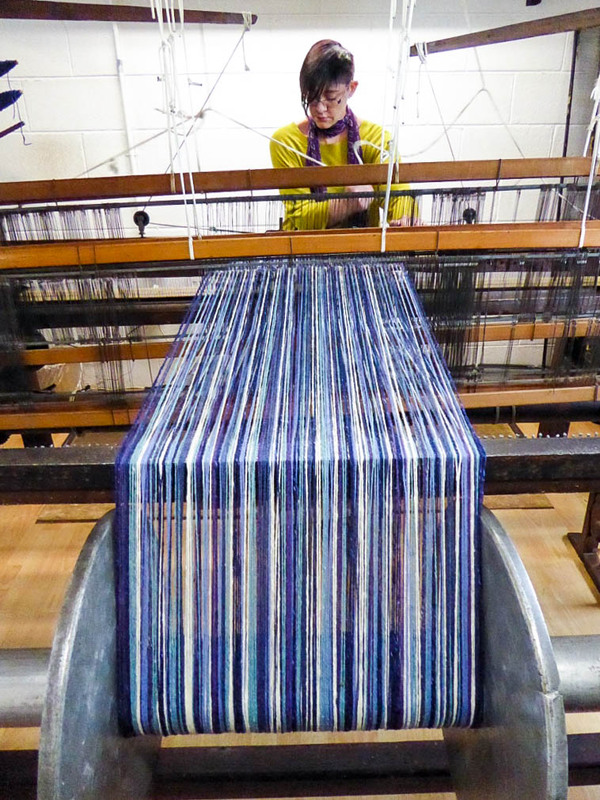 Our trip started in Co. Donegal where we met with Donegal Yarns and a range of inspiring weavers including Studio Donegal, Eddie Doherty and Clare O’Presco. We then travelled to Co. Galway where we met basket maker Ciaran Hogan and studio potter Juliet Ball. Studio Donegal - Studio Donegal is based in Kilcar, on the very west coast of Co. Donegal. It was set up in the 1970’s by Kevin and Wendy Donaghy and is now run by their son Tristan, who has a real passion for hand weaving and keeping the craft alive in the region. Weaving is done on four wooden handlooms by master weaver John Heena and Kevin McGuilicuddy who produce a range of beautiful throws, cushions and fabric for garments. These are sold via the Studio Donegal shop in Kilcar and other retail outlets throughout Ireland. Find out more about Studio Donegal here. Eddie Doherty - Eddie Doherty weaves by hand and can often be found happily sitting at his loom in the back room of his shop in the main street of Ardara, Co. Donegal. Eddie has been weaving for over 50 years, having started at 16 in Molloy’s factory in Ardara. He specialises in Donegal Tweed in herringbone and ‘salt and pepper’ styles and his shop sells items such as throws, scarves, jackets, waistcoats and caps. There were over 200 hand weavers in the area when Eddie started in the 1960’s but sadly he is one of the few remaining. Find out more about Eddie Doherty here. Clare O’Presco - While Clare O’Presco is originally from just outside London, her mother’s family came from Donegal and Clare decided to settle here after she finished university in 1999. Clare is passionate about her craft and does everything herself from designing, making, finishing and selling through her shop in the Donegal Craft Village just outside Donegal Town. She uses mostly Donegal Yarn and is drawn to bright colours and making items such as throws, scarves, cushions and caps that are a contemporary take on Donegal Tweed. Find out more about Clare O’Presco here. Juliet Ball - Juliet describes herself as a studio potter and learnt her craft in the Puisaye in Central France. Whilst she is originally from the UK, her husband is from Galway and so in 2003 they decided to settle near to Moycullen just outside Galway city, where they live today and where Juliet has her studio – Cloonmore Pottery. Juliet works in stoneware and porcelain and she makes all her own glazes using wood and turf ash from the fire in the family house. Everything is hand thrown by Juliet on her potter’s wheel, something that she clearly loves. 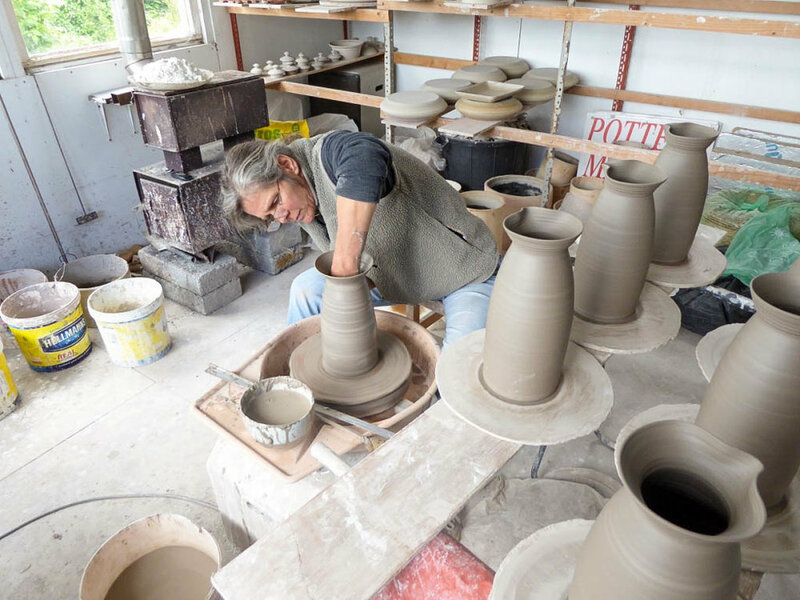 He work is mostly functional and includes bowls, plates and vases. Juliet sells via her studio in Cloonmore and at the Galway Potters Market in Spanish Arch which she set up with fellow potter Stephen Price. Find out more about Juliet Ball here. Ciaran Hogan - The Hogan name is well known for great basket making and Ciaran has followed his father Joe Hogan in the craft at his studio in Galway Craft Village in Spiddal, Co. Galway. Ciaran grows about 50% of his own willow at his father’s farm and the rest he imports from the UK. He explained in great detail the intricate process of growing, harvesting, storing and selecting willow for use in his craft and makes a range of mostly functional baskets. Ciaran enjoys the fact that he is his own boss and works with energy and passion to make and sell his baskets through his studio in Spiddal. Ciaran also teaches and a range of courses can be found on his web site. Find out more about Ciaran Hogan here.